Scheduled tour along the Silk Road consists of Uzbekistan part, Kyrgyzstan part and Turkmenistan extension. You can book the entire Silk Road tour or a certain part. Meeting at the Airport in Ashgabat. Transfer to the hotel. Check in and overnight at the hotel. Day 2 (Tue. ): Ashgabat Sight seeing in Ashgabat with visits the Independence Park, Monuments of Neutrality, Ertogrul Gazi mosque. Discover the remains of Parthian Royal Residence Old Nisa (12 km to the west from ASB), 3rd cent B.C - 3rd cent A.D. Religion- Zoroastrism. Visiting the National Museum of History & Ethnography of Turkmenistan. Return in the hotel. Overnight at the hotel. Flight to Mary. Discover the historical reserve Ancient Merv by visiting Erk Kala 6th cent B.C, Gyaur Kala 3rd cent B.C – 9th cent A.D, Sultan Kala till the Mongol invasion 13th cent, Mausoleum of Sultan Sanjar 12th cent, Mausoleum of Ibn Zaid 12th cent, the remains of Castle – fortresses "Keshk" 6-8th cent, tombs of Guifari and Bureida 15th cent. Return in Mary. Lunch in the local restaurant. Excursion in the Museum of History (representing the Khorasan region). Continue to airport to have domestic flight to Ashgabat. Arrival in ASB. Dinner. Transfer to the hotel. Check in & O/N. Early morning flight to Dashoguz. Arrival to Dashoguz, drive to Kunya Urgench. 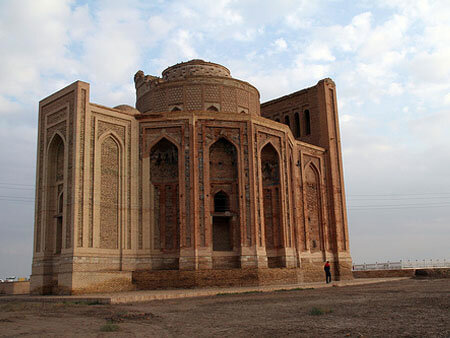 Visit Kunya Urgench historical site: Mausoleums of Turabek-Khanym, Sultan Tekesh, Sultan Il Arslan, Najmad-din-Kubra, Sultan Ali. 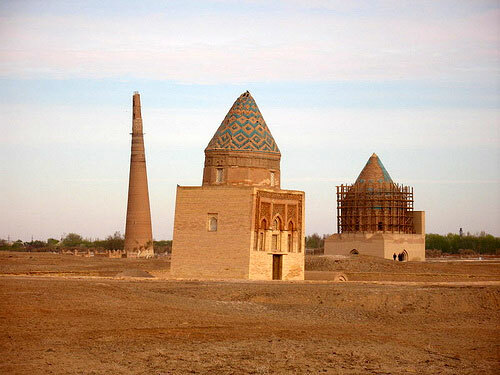 Discover the Kutlug Timur minaret & Kyrk Molla. Return drive to Dashoguz. Transfer to Turkmenistan-Turkmenistan border point. Border formalities on both sides. On Turkmenistan side meet the driver and drive to Khiva. Arrival to Khiva, check in to the hotel. Overnight at the hotel. Join the Scheduled tour group for Turkmenistan part of the Silk Road tour.